1. Line a baking tray with baking parchment. Mix the sugar and golden syrup to a paste in a large, deep, heavy-based saucepan and slowly melt over a low-medium heat until it reaches 140C or the soft-crack stage on a sugar thermometer. 2. Take the sugar off the heat and quickly beat in the bicarbonate of soda with a wooden spoon. Take care as the mixture will froth up rapidly to make honeycomb. Quickly pour the honeycomb onto the lined baking tray and allow to set at room temperature. Once set, remove the baking parchment and smash the honeycomb into shards. 3. Melt the chocolate in a bowl set over a pan of gently simmering water, making sure the water does not touch the bottom of the bowl. 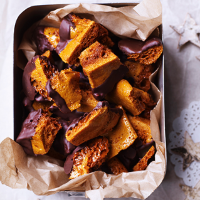 Once melted, stir the chocolate and dip the smashed-up honeycomb shards in it. Leave to set on baking parchment. This recipe first appeared in Waitrose Kitchen magazine. myWaitrose members can download the Waitrose Kitchen app edition for FREE. Find out more. This recipe was first published in Mon Nov 24 17:22:00 GMT 2014.